It seemed like a nice gift at the time for the family in Salinas, California. The friendly stranger who been up in the mountains foraging for mushrooms earlier in the day had gifted a young woman some of the mushrooms he’d found. She later grilled them for dinner for her family, her sister and a friend. She ate three mushrooms herself, her husband had four, and their toddler daughter was given a taster: half a cap. Her sister ate one cap and stalk, while the friend only picked at a few pieces. Unknowing they had all just eaten one of the deadliest wild mushrooms in the world, the Death Cap mushroom, or Amanita phalloides. Responsible for 90% of mushroom poisonings, the Death Cap thrives in every continent save Antarctica. Once it enters the gastrointestinal tract, it takes only one half of one large mushroom to kill a person. That’s an estimated dose of 7mg for an adult. For several hours, the family and their guests felt fine. But unknown to them, a toxin in the mushrooms they’d eaten had already begun to ravage their livers. Later, they began to experience vomiting, cramps, diarrhea and nausea. Within 24 hours of having eaten the mushrooms, the family of three was admitted to hospital. While the parents made a full recovery, the toddler needed a liver transplant. She also suffered permanent brain damage during her 36 day recovery. The following day the sister and the family friend checked in for medical treatment. Within the week the sister had undergone a liver transplant. Meanwhile the friend who had ingested no more than a few pieces of the Death Cap made a full recovery. Death Caps grow predominantly under the massive, gnarled Coast Live Oaks found west of the central valleys. Under the shadow of these magnificent evergreen trees lies a harvest of death with olive-green caps. While the Death Cap is more prevalent in the fall and winter, they can survive throughout the year in areas covered by coastal fog. They love the damp of a deep, dark forest. Mature Death Cap mushrooms have caps like flattish plates upturned at the edges. Early in development, the caps look more like small domes. It is the young mushrooms especially which can be trickier to distinguish from those mushrooms safe to eat. A slightly greener color to the cap can confuse even seasoned mushroom foragers. For the novices they can find themselves gambling their lives on a tidbit found in the wild. Death Cap mushrooms have no distinctive taste or smell, and their poisonous effects are not neutralized by cooking. They’re apparently delicious and look edible, and often grow among species which are safe to eat. Death Cap mushrooms are large, smooth and olive-green. Unlike some benign species they have gills, or ribs, under the cap. But the real kicker is the presence of a cup-shaped piece of tissue at the base of the stalk called a volva. This tiny sac only becomes visible once the Death Cap has been plucked, and can be easily missed. The Death Cap mushroom is spreading in California, leading to more and more severe poisoning cases. The killer fungus is believed to have been imported on the roots of decorative shrubs in the 1930s and 1940s. Since then it has spread across the state, favoring damp woodlands. Like other members of the Amanita species, phalloides contains cyclic octapeptides called amatoxin. These have a similar structure to proteins but with only an eight amino acid sequence. Amatoxin is insoluble in water, and cannot be destroyed by heat. Once ingested, it enters the bloodstream and reaches the major organs, eventually shutting them down. All organs are prone to amatoxin damage, but those with high rates of protein synthesis are the most vulnerable, such as the liver, kidneys and brain. It is the liver which the amatoxins attack first, and whose disintegration is most likely to cause death. Severe damage to the heart is also often fatal. 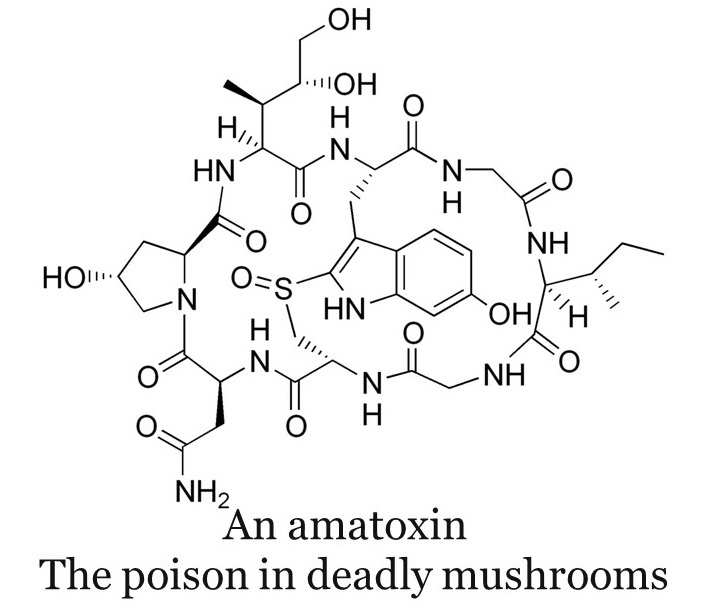 Doctors have identified three clinical stages over the course of amatoxin poisoning. After an initial latent period of 6 – 12 hours where the patient is asymptomatic, the first stage heralds the onset of preliminary symptoms. These include exhaustion, fluid loss, vomiting, nausea, abdominal cramps, and a cholera-like, watery diarrhea. These first symptoms usually last no longer than 24 hours and the patient can outwardly appear to be improving. Some patients have even been sent home only to return to the hospital again during this second stage of amatoxin poisoning. Here the amatoxins are still rampantly destroying liver cells, but only laboratory analysis will detect it. As liver hepatotoxicity increases the patient starts to exhibit the classic symptoms of liver failure. This is the third stage. Sometimes at this point doctors will recourse to a liver transplant if certain selection criteria are met. But up to 20% of amatoxin poisonings prove fatal, and once this third stage is reached, the patient can be dead within the week. The Death Cap mushroom is a crafty and dangerous little critter to pick. But it’s worth remembering that 99% of over 5000 mushroom species are benign to humans. If you’re a novice at mushroom foraging you are still advised to exert extreme caution. Always consult a good reference book, and better still, an expert mycologist before consuming any wild mushrooms. The risk to health just isn’t worth eating something you’re not 100% sure about, especially if it’s been given you by a stranger. Enjoy this article? My book has tons more just like it!